A group of Eau Claire educators who go above and beyond to help their students achieve were honored at the Third Annual Golden Apple Awards in April. Award-winners are nominated by their peers and are selected from each of the 20 schools in the Eau Claire school district. According to the Eau Claire Public Schools Foundation, which oversees the program, each winner receives two $500 grants: One is an unrestricted grant that can be used by the winner in the classroom or school in any way he or she chooses; the other goes to each school’s Fund for Today, which the principal can use for the school’s greatest needs. In addition to being honored at an April 5 banquet at Wild Ridge & Mill Run Golf Course, the winners were profiled by WEAU 13 News. To see videos of the honorees and to read more about them, you can find the WEAU stories at tinyurl.com/2018GoldenApple. 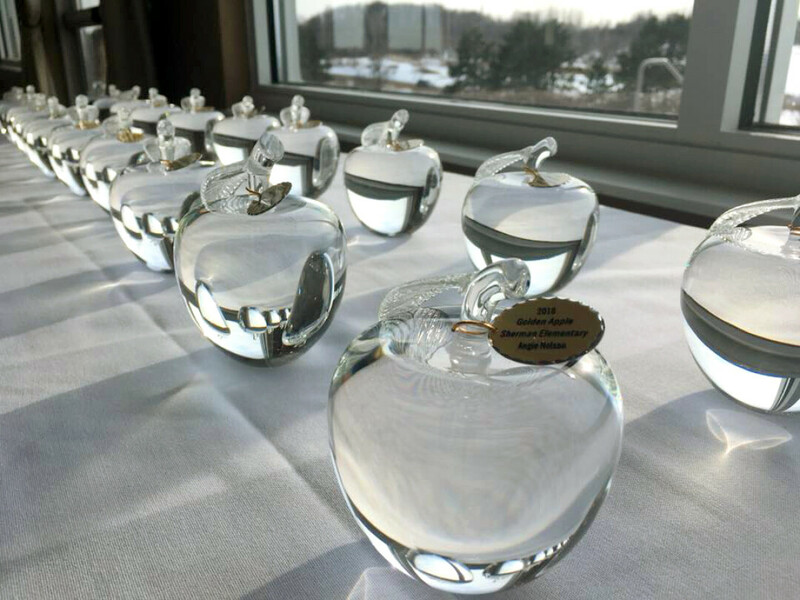 To learn more about the Golden Apple Awards or to make a gift to the Eau Claire Public Schools Foundation, contact Executive Director Sarah French at sfrench1@ecasd.us or (715) 852-3015.